The ranch enjoys an unblemished reputation for excellence in every aspect of the purchasing experience. Our customers are able to view and ride all our horses in a safe and pressure free environment at our first class facility. 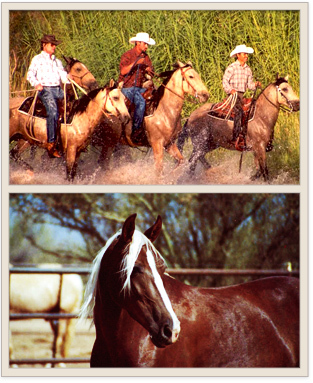 We employ Natural Horsemanship training and stock keeping methods, and emphasize correct shoeing and saddle fitting techniques. All horses are on regular maintenance schedules of immunizations, teeth floating, deworming and shoeing. The following is a small representation of the type and quality of horses that we have available for you. Due to the incredible demand for our fine horses it is not practical to keep the website current. Please keep in mind that inventory, training status and prices constantly change. We ship horses nationwide and overseas. To insure a perfect match between horse and rider, horses will not be sold over the Internet. For the latest inventory and for your particular needs please contact us.